The following history, Swan Barracks, Francis Street, Northbridge is extracted from a booklet produced by the 5th Military District in 1992. It is well researched and put together for anyone to read. Perth's association with the military dates to the birth of the colony in 1829 when Governor Stirling travelled west to establish a defensive base. The colony's first corps of volunteers was formed en route to the new colony but was soon disbanded amid the stresses of early settlement. The volunteer corps did not re-emerge until September 11, 1861, when a meeting of citizens voted to form a militia. 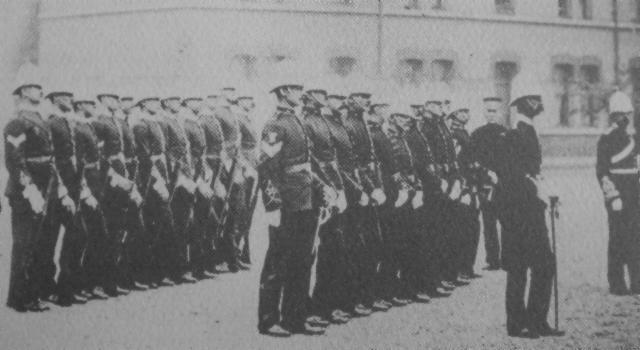 Only three days later, after a deputation from the meeting had gained the approval of Governor Kennedy, the first drill parade was held at Barrack Square. Within two weeks the Metropolitan Volunteer Rifle Corps numbered 100 effective members and seven honoraries. Parading at 5.30am and 6.00pm every day the men earnestly went about training to defend the young colony, not only from potential outside invaders, but from the ever present threat of convict uprising and attack from natives. 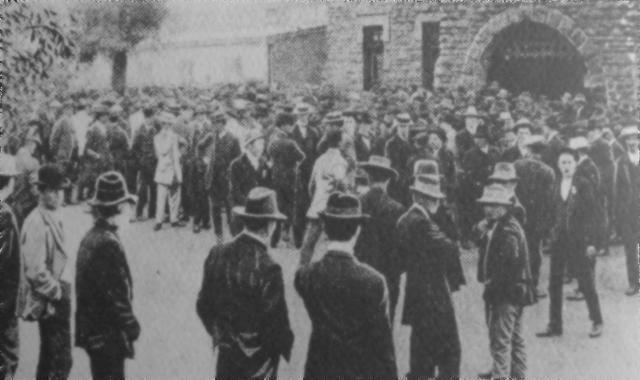 The reality of the threat was confirmed only a month after the militia was formed when raiding natives speared a soldier in Barrack Street near the Perth Town Hall. Such instances ensured the corps the support of concerned private citizens who donated funds and the colonial government which gave encouragement and a small annual grant. In February 1892 the colonial government withheld the annual grant of 15/- from the Perth Corps, a decision that did not sit well with the volunteers who voiced their displeasure in the strongest terms. The resulting insubordination charge saw the disbandment of the Metropolitan Corps. A cooling of heels, some apologies and growing international tension, however, soon saw the volunteers reformed under the new title "The Perth Company of WA Rifle Volunteers." "add ... to the popularity and efficiency of the volunteer force." 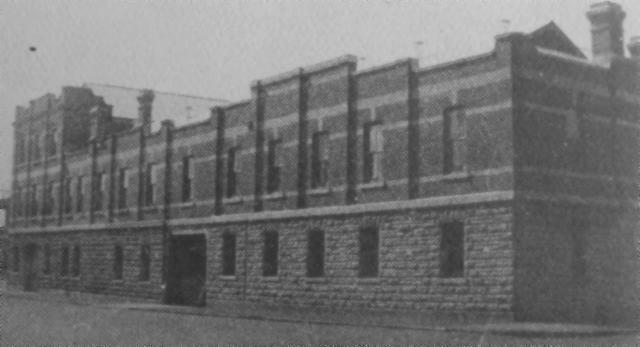 In 1897 the Perth Volunteers moved into their new headquarters at the drill hall in Francis Street and the Western Australian volunteer movement made its headquarters in the stone administration building. 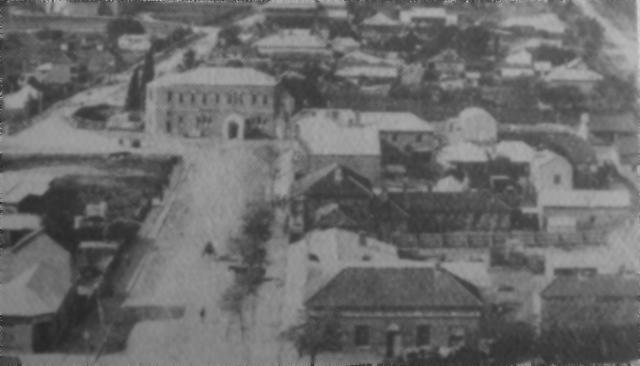 The buildings quickly increased the popularity of the force and served as a rallying point for volunteers at the outbreak of the Boer War in 1899 with 1,233 Western Australian Volunteers joining the Australian Bushmen's Contingents. WA soldiers cross Barrack Street Bridge on their way to the Boer War, 1899. As in all wars to follow, the soldiers of WA fought with distinction in South Africa with one landmark named West Australian Hill after a battle in which 20 Western Australian soldiers held off a force of 300 Boers. The outbreak of war in 1914 again sent Perth into a patriotic fervour. The rush of volunteers to the Francis Street headquarters initially overwhelmed officials who were forced to set ridiculously high standards to stem the flood of enlistments - even men with dentures were turned down for the first contingent. John Simpson Kirkpatrick, better known to the world as Gallipoli's "man with the donkey" was among the many notable soldiers to sign up at the barracks. "the security of vulnerable points of positive military importance against the activities or enemy agents or other ill disposed persons." On activation of such plans, the guards at Francis Street had it better than many of their peers. The lack of adequate kitchen facilities had the soldiers dining in local restaurants with Government meal tickets. The call-up for World War Two saw the showgrounds in Claremont double as a recruiting centre, sparing the barracks for the rapidly increasing administrative work load. 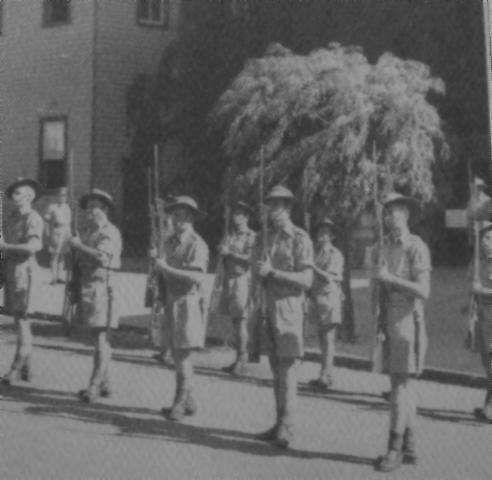 On parade at Swan Barracks, 1943. By the end of World War Two Swan Barracks housed the headquarters of the 3rd Australian Corps, Western Command and the 5th Military District. With the Army reverting to peacetime proportions after the war the large headquarters shrunk away. By 1960 Headquarters Western Command was the sole occupant. That headquarters enjoyed sole occupancy until the staff function was divided in 1973 to form the 5th Field Force Group and 5th Military District. The final title of Headquarters 5th Military District was adopted in June 1980. With the move towards the doctrine of self reliance in the 1980s the Australian Defence Force (ADF) began to realise the benefits of a more cooperative or joint approach to operations. An ADF headquarters was formed in Canberra and several steps were taken to create a single command and control system for the national defence resource. Significant among these steps were the 1989-90 Force Structure Review, which restructured and directed resources to combat elements, and the 1990-91 Defence Regional Support Review which reduced service and civilian duplication in administrative support. Military District, District Support Unit Perth, the Defence Regional Office Western Australia and several smaller service and Defence organisations into a new Defence Centre Perth. The amalgamation, coupled with the need to reduce Defence property and maintenance costs, led to the decision to vacate Swan Barracks. In June 1992 the headquarters moved to its new premises at Leeuwin Barracks, East Fremantle, ending a 95-year association with Northbridge. Swan Barracks, however, remain a lasting memorial to the Army's part in the early history of Perth and to the many brave Western Australians who served this country so valiantly. The first two storeys of Swan Barracks' central stone building, and the drill hall behind it, have the distinction of being among the oldest buildings in Northbridge. Local builders Holman and Cousten's tender of £52,080/1/11 for construction of the drill hall was accepted on 16 August 1895. The building was supposed to have been finished by December but it was not completed until Christmas Eve 1896. The lengthy delay must have been difficult to accept given the growing demand for the hall and the contractor's recent experience with an almost identical building. Drill Hall and Administration Building, 1898. The distinctive curved trussed roofing used on the hall, quite modern for the time, was the same as that used for another military drill hall built by Holman and Cousten in Holdsworth Street Fremantle in 1895. The frustrating delays were set to increase when Holman and Cousten's tender of 1400 pounds for the administration building was also successful. On its scheduled completion date of September 30, 1896, construction of the building had barely started. The tardiness appears, however, to have had little to do with the contractors. In his historical survey and management plan of the barracks, Perth architect John Stephens says the delays may have been caused by the rejection of the original plans drawn for the administration building in 1895. "There may have been some problem with the design of the administration buildings," he says. "New plans were drawn up in April 1896 and a tender was accepted in July, but it was not signed by the contractors until February 1897. "Construction of the Royal Mint Building (now the Perth Mint) may also have slowed work in the less prestigious building at Francis Street. In 1900 another drill hall was built west of the existing structure. The hall was designed, and the construction supervised, by J.J. Talbot Hobbs (later Sir), a prominent local architect who was also a major with the volunteers. At Federation the new Commonwealth took over the buildings, then valued at 11,315 pounds. The present facade of the stone administration building has been part of the Northbridge landscape since completion of the third level in 1910. When the building was finished one soldier said it resembled "Castle Greyskull", a fantasy castle of children's fiction. The parapet and robust design of the new floor certainly complemented the romantic characteristics of the earlier building, enhancing its imposing and distinctive street facade. The next addition to the expanding complex was the two-stage construction of the red brick and stone buildings on Museum Street. 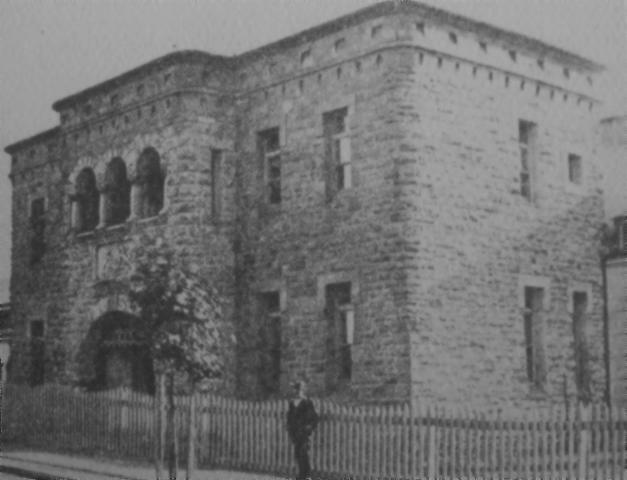 The first portion, the three level building at the North West corner of the site, was built in 1905. Six years later the second stage filled the remaining Museum Street frontage as well as taking up part of the western Francis Street frontage. These western buildings were modified significantly in 1936 to provide an entrance, staircase and fireplace for the officers’ mess on the corner of Museum and Francis Streets. 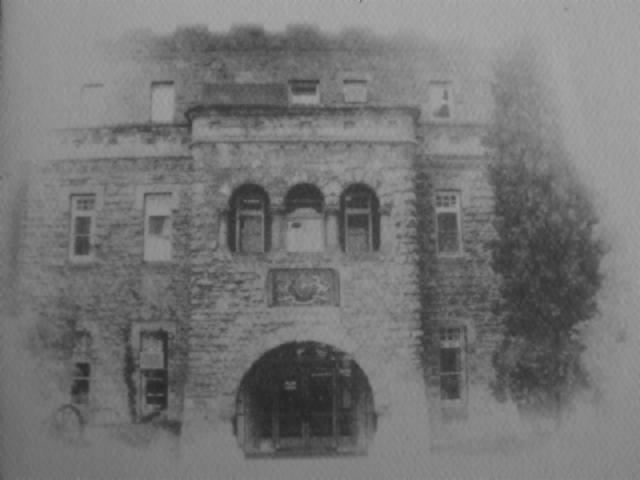 The modifications also saw the United Services Institute (USI) moved from its original rooms next to the officers mess to the second floor of the North West corner. Museum Street frontage of Swan Barracks, 1910. The original plans for the east and west wings on Francis Street were also drawn in 1936 but a later sketch dated June 1939 appears to have been the basis for the building. Wartime secrecy clouds the detail, but the east wing (on Francis Street) and the north east wing (bordering Beaufort Street) were probably built in 1941 to cater for increasing administration pressures of World War Two. While the date of completion of the western wing (Francis Street) is not recorded, it is likely to have been finished around the time of the demolition of the Artillery Drill Hall in the later half of the 1950s. With available space being all-but filled, construction work after 1955 was restricted to relatively minor internal alterations. Among the more notable alterations for the soldiers was the extension of the Sergeant's Mess in the late 1970s into the part of the north east wing formally occupied by an other ranks canteen. The ORs canteen was relocated to a partitioned area at the eastern end of the drill hall. Demolition of Artillery Drill Hall, 1955. Over the years of development few rooms in the barracks have been left untouched. The building, while of significant historic value, was primarily a workplace and work needs often had to take precedence over aesthetics and nostalgia. Swan Barracks remains, however, one of Perth's most distinctive buildings and it will remain a focal point in the memories of those tens of thousands of Western Australian soldiers who either enlisted or served there. The present site of Swan Barracks would be all-but unrecognisable to Perth's earliest inhabitants. An 1833 plan of the colony shows the ground occupied by the barracks (half a hectare) was once covered by a system of "fresh water swamps with rushy margins". The swamps restricted early development but by the 1870s the area had been subdivided, some lakes drained or built over, and market gardens were flourishing. The low-lying land was, however, regularly flooded. The resulting health risks and crop destruction prompted construction of a large drain connecting Lake Kingsford (now the railway station) to Claise Brook in East Perth. With the physical barrier of the lakes removed expansion to the north was made practicable, but a town planning decision was about to establish a more lasting barrier. 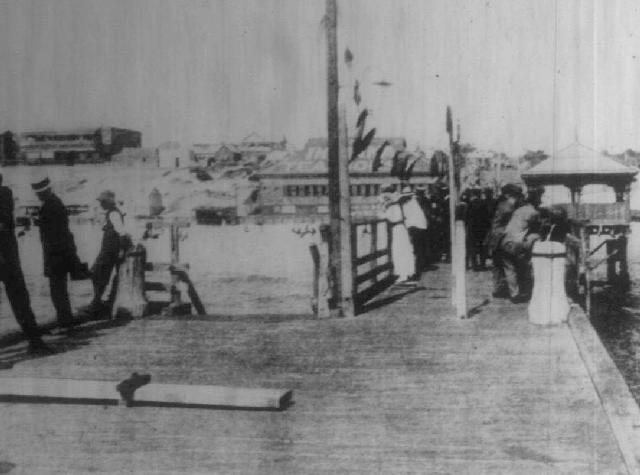 Construction of the Perth railway system in 1879-81 linked Perth with Guildford and Fremantle but cut the northern part of the city from the well established commercial centre. Erection of the Barrack Street Bridge in 1894 and the Horseshoe Bridge in 1903 did not bring the area out of economic depression as planned, and it gradually gained an unsavoury reputation. At the time the barracks was being built the area was better known for its trade in intimate services than in goods. 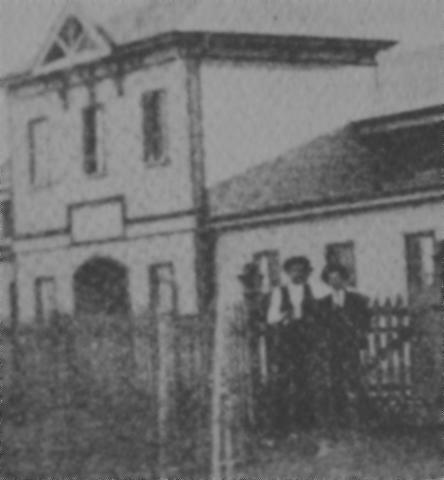 In 1900 most of Perth's 45 brothels were in Northbridge. While prostitutes were hard at work so too were the builders. Gold rushes in the Kimberley, Kalgoorlie and Coolgardie brought money and people to the colony along with a public building boom. 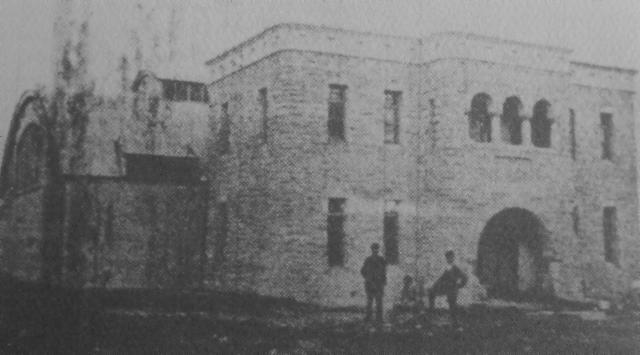 The boom saw construction of the barracks, the art gallery, the library, law courts and the Perth Boys School but it was short lived and by 1910 construction had all-but ceased. 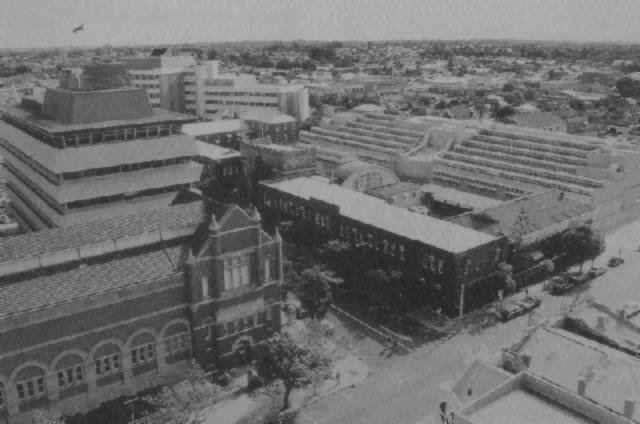 Calls for the development of the area as a "cultural precinct" in 1955 were ignored and the red lights of the older professions blazed ever more brightly in Roe Street. The unseemly reputation of the area was eventually buried beneath another public building boom in the 1970s which saw construction of the museum administration building (opposite the barracks) and the new Art Gallery. The cultural base was extended again in the 1980s with development of the Alexander Library and Perth Technical College (immediately north of the barracks). Swan Barracks' near-Gothic facade may now seem out of place in the present cosmopolitan landscape. That notwithstanding, the buildings continue to provide a tangible Army link with Northbridge's colourful past. One thing West Australia was famous for was its wonderful beaches. No where in a metropolitan area in Australia are there such glorious beaches. 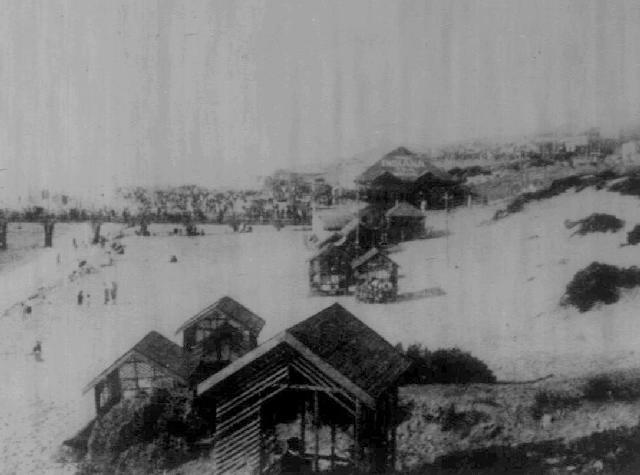 In Perth, the most popular beach was Cottesloe. It was the place to go in summer and the place to be seen. Looking at the pictures, some of the human geography has changed but the popularity remains the same. Just a quick look at the setting clearly illustrates why it was so popular. For a long time there was the jetty until it was replaced by a groyne. In the distance you can see the Indiana Tea Rooms. On the right of the tea rooms is the Ocean Beach Hotel. This was the destination for most teens who wanted a beer. The hotelier was very understanding of this problem. So long as you looked over 21 [whatever that meant] you were served. Of course, the Police Liquor Squad would raid the place often. The loos were a great place to escape such a raid. Most people who lived around Perth will have similar Cottesloe experiences. Having fun at the sea. Not sure how much fun it can be in a suit and tie. 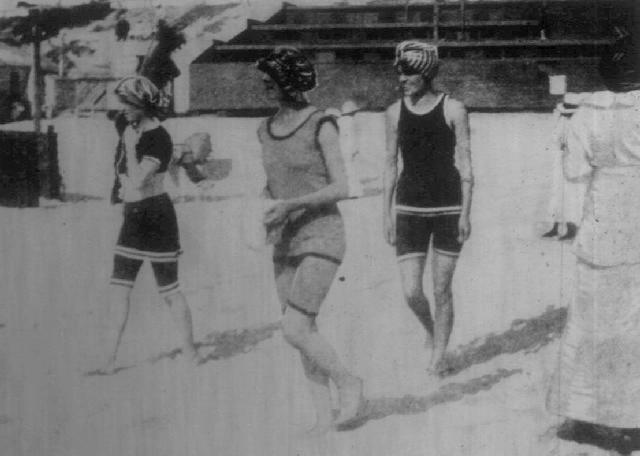 Apart from the attire, this is how Cottesloe Beach always looked - packed with people enjoying the sun and surf, even if they weren't actually swimming. Families, couples and friends would promenade up and down the jetty. It was one of those pleasures. There is now a boardwalk to the groyne where the same activity still happens. Three flappers in their neck to knees getting ready for a dip. One thing that stands out is the lack of sun tan. It was considered to be a sign of beauty to look pale as a tan was the sign of a manual labourer. 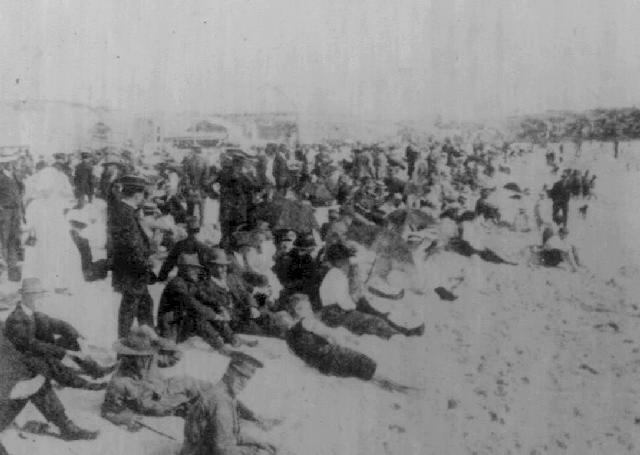 Cottesloe Beach was and still is possibly the most popular beach for the good folks in Perth. The local newspapers extolled its virtues and people flocked to sample them. It was a popular place for soldiers to bring their squeeze before going overseas. The highlight of the Fremantle social calendar was the "Silver Chain" Ball. This was one of those fancy dress balls where the good folks were asked to give their interpretation of the dress worn by those in the days of yore. The costumes worn are a wonderful reflection on how the good folks interpreted their past during the contemporary period. All the pix noted below were taken by CM Nixon of Fremantle, a reputable photographer in the area, was hired to do photo shoots on major Fremantle occasions. 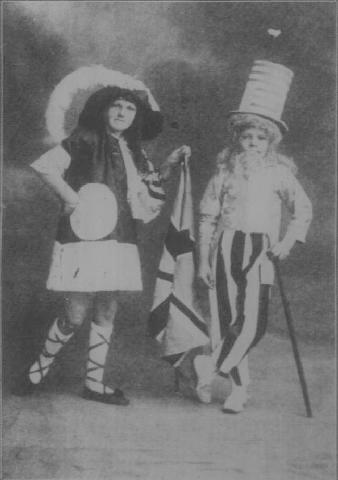 Pic #1: This is a pic of two girls, Hazel Collett on the left and Mavis Doepper to the right, dressed up as a "Rag Time Couple". Rag Time was big in Australia at the time. It was the syncopated beat that made it so attractive. The tunes of Scott Joplin will give an example of Rag Time, a beat that was transformed into Jazz and then Mo Town of today. Of course, this is a non American white interpretation of Rag Time rather than any deep American south reality. 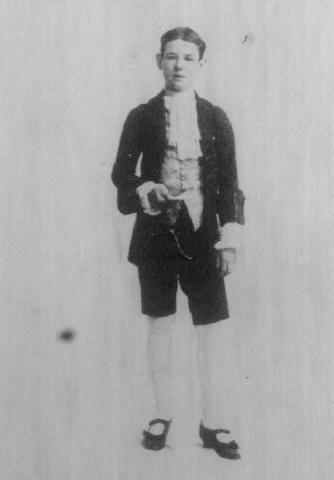 Pic #2: Here is Jack McNeece who was awarded a special prize for his portrayal as Uncle Tory. Nothing like a good old solid Tory. Almost reminds me of the satire in Gullivers Travels when Swift is describing the difference between the Tories and the Whigs. As to the first, you are to understand, that for about seventy moons past there have been two struggling parties in this empire, under the names of Tramecksan and Slamecksan, from the high and low heels of their shoes, by which they distinguish themselves. It is alleged, indeed, that the high heels are most agreeable to our ancient constitution; but, however this be, his majesty has determined to ake use only of low heels in the administration of the government, and all offices in the gift of the crown, as you cannot but observe; and particularly that his majesty's imperial heels are lower at least by a drurr than any of his court (drurr is a measure about the fourteenth part of an inch). The animosities between these two parties run so high, that they will neither eat, nor drink, nor talk with each other. Everything changes but nothing changes. 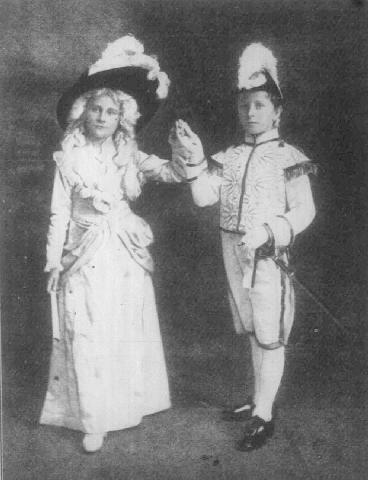 Pic #3: Here are Roy and Doris Wallis who came dressed respectively as the First Lord of the Admiralty and Duchess of Devonshire. They were awarded the prize as the Best Dressed Couple. This, of course, was a historical interpretation, since at the time, the First Sea Lord was Prince Louis von Battenburg until he resigned in favour of Fisher. Neither looked like this in their attire. 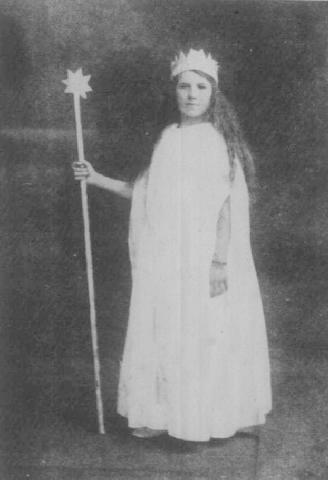 Pic #4: This is young Miss Elsie Dunn posing as the "Queen of the Druids". For her efforts, she received the prize as the Most Originally Dressed Girl. Of course, this is a fantasy presentation. Local knowledge of Druids was confined to that elicited from the legends of King Arthur. The Druid theme was big at the Ball, as the next pic will demonstrate. 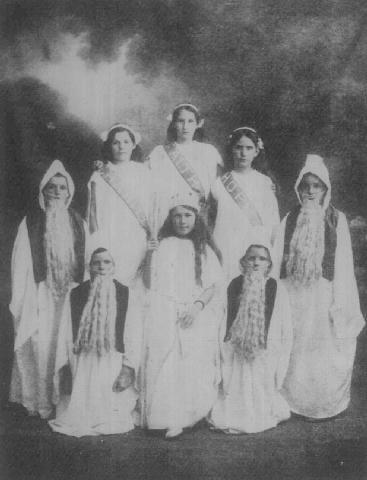 Pic #5: This group of young girls and women was collectively awarded First Prize for their costumes, a work which was called "The Druid Set". Over the last century nothing has changed in the portrayal of Druids. The film version of "Lord of the Rings" presents Druids in a similar manner. For those avid readers of Asterix, the Druid Getafix, is also portrayed like this. So too are the Smurfs. In contrast to the Druidical theme, three of the young women are wearing sashes with words that come straight from 1 Corinthians 13:13 from the King James Version. An interesting juxtaposition to say the least. Well the clock has stuck midnight and all the good folks must leave the ball.